Free trade advocates preach free market values, but pro-corporate tools like the ISDS reveal a fundamental truth about global free trade today; it is less about ideology than it is profit. 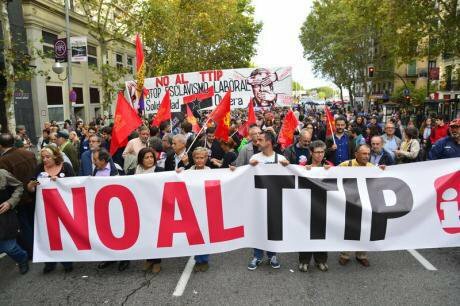 Demonstration against TTIP in Madrid. Demotix/Marcos del Mazo. All rights reserved.Since globalization took off in the 1980‘s, free trade agreements have generally been promoted by advocates as natural components of the free market. Mainstream economists, whether from more conservative branches like the Chicago school, or of progressive Keynesian disciplines, ultimately believe that the free market works to a degree, and that it should be promoted by governments around the world. Of course there are major differences; progressives believe in strong regulatory apparatuses, while conservatives would have governments small enough to “drown in a bathtub” if possible. But the underlying belief in the free market essentially guides both economists on the left and right of the mainstream. Naturally, with the free market, comes free trade. And with the rise of neoliberalism on both sides of the Atlantic (i.e.Thatcher and Reagan), freeing up international trade has become an important part of government policies and a major contributor to globalization. The World Bank and International Monetary Fund have played major roles in eliminating protective barriers for developing countries, and major trade deals, like NAFTA, have created an increasingly friendly environment for multinational corporations around the globe. Protective barriers, like tariffs and subsidies, which helped American and other modern industries develop during the nineteenth and twentieth centuries, are now rejected by wealthy countries and denied to developing countries through global trade deals and lending requirements. An example of this would be Latin America in the 1980’s, after the debt crisis, when developing countries like Mexico were forced to embrace free market austerity policies in order to receive rescue loans from the IMF and American banks. Forcing certain policies on sovereign nations is one of the many aspects of free trade that seems contrary to freedom. But the most hypocritical features of most modern free trade agreements comes in the corporate welfare "Investor-State Dispute Settlement" (ISDS) provision, which both the Trans-Pacific Partnership (TTP) and the Transatlantic Trade and Investment Partnership (TTIP) are expected to include. The ISDS allows corporations investing in foreign countries to sue governments through international law, whenever a new domestic regulation or law may hurt the companies future profits. Whether it be environmental regulations, or laws protecting the health of citizens, if there is any possibility that profits will be diminished, investors can take the country to international arbitration. The thinking behind this provision, which was first introduced in a trade deal with Germany and Pakistan in 1959, and has since been implemented in thousands of trade deals, was to protect foreign investors from any political volatility that could hurt investments, and therefore increase foreign investment around the world. Currently, there are about 60 cases filed annually and over 500 in arbitration. Many times, corporations use the ISDS to bully countries into backing down on regulations. This is occurring in the small town La Oroya, Peru, where American company Renco Group is suing the government after they shut down a metal smelter because the company had delayed environmental improvements. La Oroya is one of the most polluted towns in the world, and it is devastating for children, where 99% have lead blood levels that “exceed acceptable limits.” The Renco Group has used the ISDS as a bargaining tool, and by 2012 got the Peruvian government to restart its zinc operations. Sometimes corporations even manage to sue their own governments. After Quebec filed a moratorium on hydraulic fracturing, the Canadian extractive company Lone Pine shifted its headquarters to the United States to sue the Canadian government through the NAFTA agreement. They are seeking $250 million in damages. Tobacco company Philip Morris has made a similar move, rearranging its assets to become a Hong Kong investor so that it could sue Australia through a 1993 trade deal between Hong Kong and Australia that included the ISDS provision. Morris is suing the government for lost profits after they enforced a plain-packaging law that prohibits branding on cigarettes packs, which has been shown to decrease smoking in young people. Basically, the investor-state dispute settlement is a free insurance policy for multinational corporations, paid for by taxpayers around the world. It is also the opposite of what so many free trade advocates preach, i.e. the free market. In a truly free market, investing and running a business is risky. In America, eight out of ten businesses fail within the first eighteen months, and there is no guarantee that external events will not hurt a companies profit. This is why insurance was created, to protect companies or individuals from rare events that could hurt them or their companies. Pro-corporate tools like the ISDS reveal a fundamental truth about global free trade today, which is that it is less about ideology than it is profit. Of course this truth wouldn’t go far in convincing citizens. So advocates praise trade deals like the TTP and TTIP because they will create a more open and “free” society. Milton Friedman, a major influence on the rise of neoliberalism over the past three decades, popularized the idea that economic freedom is a necessary precondition for political freedom in his book Capitalism And Freedom. This may seem like an odd notion, but it has made a big impact on the world today. Indeed, economic freedoms and protections for businesses seem to be held in higher regard than many political freedoms around the world. If it were just about free trade, these trade deals would simply eliminate tariffs and limit subsidies. But it is not just about free trade, it is about providing different industries with special benefits over countries and citizens. Today, through trade deals and sheer power, corporations seem to have more freedom than human beings. The TPP and TTIP will only increase this inequality between citizens of the world and multinational corporations. Whether free trade is good for societies around the world is debatable. But what is not debatable is who benefits from a provision like the the investor-state dispute settlement, which has become all too common in trade deals around the globe. It is a blatantly pro-corporate mechanism that treats massive corporations like hopeless children in need of protection. Billion dollar companies do not need protection from governments, but societies do need protection from billion dollar companies. Advocates of free trade need to sharpen up their ideological doctrines. Are they simply for freeing up trade around the world, or are they for providing wealthy investors with welfare provisions that go against the supposed “free market” ideologies that they support. Many of these free trade promoters like to criticize social welfare programs, saying that they are antithetical to the free market, yet they never seem to notice all of the corporate welfare handouts that deals like the TPP and TTIP provide. When governments regulate the free market and provide social welfare benefits to citizens, they call it socialism; but when governments provide corporations with welfare, they call it freedom. This hypocrisy of the contemporary free trade movement reveals the corporatism hiding quietly behind their facade of free market values. Two of the biggest trade deals in history are expected to include the ISDS provision, which will challenge the ability of governments to properly regulate industry and protect citizens from corporate dangers. This is not freedom, but oppression.